Tried it the other way described in the ophcrack thread but doesnt work. Rename all files to lowercase and remove the points at the end of the filenames (isolinux/syslinux is case sensitive). Copy /root.dat from the pcloginnow directory to the root (/) of the UBCD directory. Maybe you have to copy program.mo also tho the root of the UBCD directory (not completely sure about it). I don't have windows, so when I boot the CD, I get a GUI at a certain moment which says that there are no windows partitions. It asks very nicely to reboot, without giving you another option, so I am not completely sure that you need the program.mo file for the recovery itself. Add the following to the custom.cfg. PCLoginNow! is based on the GParted live CD (look at the contents of the file /syslinux/boot.msg with notepad). It contains a lot of unnecessary files. Inside the initrd (rd): (rd is gzip compressed, contains initrd which is cpio compressed) the init file contains the following section. If this is done by the author of PCLoginNow!, you can get a much cleaner directory layout for PCLoginNow! With the current version this is not possible. Icecube wrote: If this is done by the author of PCLoginNow!, you can get a much cleaner directory layout for PCLoginNow! The root.dat file has to be in the root of the extracted UBCD folder. Try QEMU or VirtualBox as other emulators to see if it works. Maybe you have to enlarge the amount of RAM, that you give at the virtual machine. I tested it in QEMU with 128MB of RAM for the virtual machine. The thing is i have it set up correctly. I am using virtualbox with 1gig of ram dedicated to the box. It has something to do with my XFX 8800GTS 640MB graphics card...seems like it doesnt support newer hardware...which is really sad. They also misspelled contact. Is there anyway to fix this??? Does this in UBCDv5beta10 aswell. PCloginNow is a very crippled version of the Gparted liveCD. The author of PCloginNow, disabled a lot of parameters that can be set when using Gparted liveCD. If you have only a the PCloginNow! iso (no hdd atached to the VM), it will give you the error about 'Video is Unknow device 80ee:beef,, using Xorg Server". When using the customized UBCD iso, you can add vesa to custum.cfg to avoid this problem with Xorg. cdroot=/dev/hdc is the cdrom drive if you have 1 cdrom an 1 hdd in your virtual machine. * Extract the UBCD50 iso to C:\ubcd-extract\ for example. * Extract the PCloginNow! 2.0 iso to C:\PCloginNow\ for example. * Copy C:\PCloginNow\boot\linux to C:\ubcd-extract\ubcd\custom\pclogin\. * Copy C:\PCloginNow\rd to C:\ubcd-extract\ubcd\custom\pclogin\. * Copy C:\PCloginNow\root.dat to C:\ubcd-extract\. of Windows are completely supported. 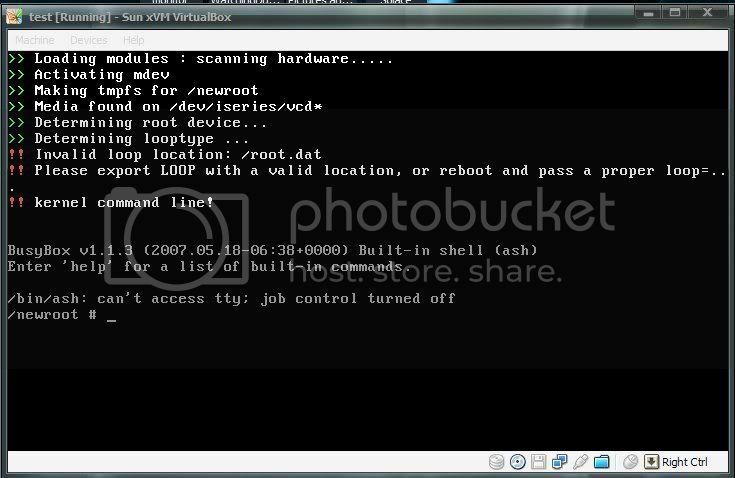 The cdroot=/dev/hdc is needed in VirtualBox, on real hardware cdroot can work to. If you run UBCD from an USB stick, change it cdroot=/dev/sdX (where X can be [a-z] (e.g. : /dev/sdb) (your internal hard drive will probably be /dev/sda), if cdroot doesn't work. Works great!!! It spits out an error before loading modules: scanning hardware - "warning:seems incorrect parameters in cd ..." probably due to forcing cdroot to dev/hdc im assuming...doesnt effect fuctionality and it will be changed back to cdroot before writing it to usb. BUT...what if I wanted to also add PCRegedit to it aswell. They both use the same files....how would I go about adding them so both could run considering root.dat and program.mo are named the same and both are required by both programs (both different sizes checked). I probably can add PCloginNow and PCregedit to Parted Magic as modules. I need to to some testing first, but I think it is possible. This will solve the problem with the crippled made version of Gparted liveCD by the developer of PCloginNow and PCregedit. can you write in detail , how to add PClogin and PCregedit as module to parted magic?? shamurshamur wrote: can you write in detail , how to add PClogin and PCregedit as module to parted magic?? I have added pcloginnow in ubcd . But it requires extra 50 MB space. Is it possible to add just the main program file of pcloginnow "PROGRAM.MO"
to linux distros like parted magic as a module? Yes, this is possible (I have some problems with PCregedit because it needs additional files, didn't look futher in it yet). I will post the modules when I have them finished (will be in the UBCD50 subforum). Icecube wrote: Yes, this is possible (I have some problems with PCregedit because it needs additional files, didn't look futher in it yet). well, i am not interested in pcregedit much . so if you have figured out the way of adding pcloginnow only , to parted magic as module , then you can tell me. Yeah, I have found a way, but Parted Magic (last test verison) doesn't load the modules when using the livemedia option for the moment (will be fixed soon). The PCloginNow and PCRegedit script that mounts all partitions needs some finetunings (now, it won't work when the partition is already mounted). Other PC programs (PCCMOScleaner and PCDiskEraser) don't need any changes anymore. I am currently very busy with other things, so I don't know when I will publish them. See: viewtopic.php?p=7033#7033 for the modules and instructions.